Datu Paglas makes a point: Among the ardent listeners are Hatta Dimoporo, LP candidate for vice governor, NIPS managing Trustee Dr. July Teehankee and FNF's Dr. Ronald Meinardus. 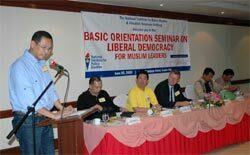 Continuing the effort to strengthen the liberal forces in Southern Philippines, the National Institute for Policy Studies (NIPS) with the support of the Friedrich Naumann Foundation (FNF) held a Basic Orientation Workshop on Liberal Democracy or BOLD workshop on June 2, 2005 in Davao City. Eighty Muslim leaders, the majority of whom are coordinators and candidates for the upcoming elections in the Autonomous Region of Muslim Mindanao (ARMM), attended the one-day event. Leading the delegates was Datu Ibrahim “Toto” Paglas, the Liberal Party (LP)’s candidate for regional governor and his running mate Hatta Dimoporo. “This is a memorable day,” said Datu Paglas before he presented his vision of governance for the autonomous region. “As Filipino Muslims we have to show to the world that we don’t have to rely on Manila to run our own affairs,” he said. In his speech, FNF’s Resident Representative Dr. Ronald Meinardus shared his views on the relationship between liberalism and Islam, an issue the delegates discussed at length at the workshop. “For many years,” Dr. Meinardus said, “we were told to believe that liberal values are Western concepts and incompatible with Asian values. Today,” he continued, “we have a similar situation as many say freedom and democracy are incompatible with Islam. This is one of the most serious misunderstandings of our times,” he concluded by pointing to the existence of Muslim democracies and Muslim democrats fighting authoritarianism in various parts of the world.